A bizarre disappearance in the unforgiving landscape of the Colorado Mountains spells danger for delivery driver Patricia McCormick. Police scour the 15 miles of treacherous mountain roads on her route, but find no sign of the woman. With no sign of an accident and no reason to suspect foul play, investigators are at a dead end. Can psychic Noreen Renier break the case with her vision of a ghostly, abandoned town? When a prominent businessman’s truck is found abandoned on a rural road, the police must determine if he has gone missing on purpose, or was the victim of foul play. 48 hours later, with still no sign of the missing man and no logical explanation for his disappearance, police bring in psychic Noreen Renier. Can her visions of two different weapons and a deal gone bad shed some light on this mystery? A serial killer is holding New York hostage. He is picking out his victims according to their astrological sign, leading the press to dub him The Zodiac Killer. Two eyewitnesses to one of his shootings say the killer is black, but the only solid clue police have to go on is a cryptic note left at one of the scenes with a symbol of a cross within a circle. 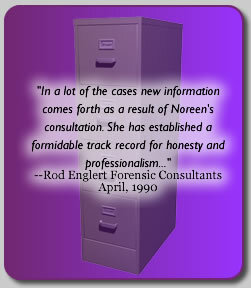 Psychic Noreen Renier is brought onto the case for any insight she may have. She is able to see the face of the shooter. But he’s not a black male—he’s Latino and his name is Eddie. Is the psychic right? A government employee working in the tiny border town of SHelby, Montana is found dead, the victim of an apparent car accident. But upon a closer look, detectives determine that this was no accident - he's been shot. When the ensuing murder investigations hits a wall, detectives hope psychic Noreen Renier can give them a lead. Her visions of the murder scene and portions of the killer's name lead police to a fleeing suspect. Would a frantic police chase to the Canadian border in the the capture of a killer? Women are being stalked in picturesque Staunton, Virginia. The stocking-masked assailant leaves few clues and police are baffled. 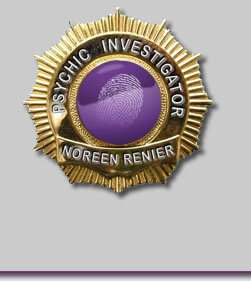 Investigators enlist the help of psychic Noreen Renier. Her visions begin with a delivery truck going round and round. Will she be able to see more and help capture a criminal? When Noreen Renier is asked to help in a stalled murder investigation she can immediately envision the crime scene, right down to which lights were on in the home. Convinced of her abilities, police follow her suggestions and set up an elaborate sting at the victim's funeral and investigate similar murders in a nearby town. But the biggest break wouldn't come until Renier visited the crime scene and saw the murderer's face in the mirror. Why would Dot Crain disappear and leave her husband and two children behind? Her sister reveals that Dot has a boyfriend, but no lead pans out. Crain's family insists on bringing psychic Noreen Renier into the investigation. Renier tells police that Dot's purse has been taken, and she's had a blow to the head. But it would be her next vision that breaks the case. Police enlist the help of psychic Noreen Renier in a baffling missing persons case. Even though Norman Lewis has been missing for months, Renier is convinced he can be found somewhere in his car. Police are skeptical, as there is no indication that Lewis would flee his home, but Renier is sure her visions are right. The daughter of a popular South Carolina State Senator is found dead in her car, the victim of a tragic accident. But when police start to analyze the scene, a more sinister picture starts to emerge. Can psychic Noreen Renier help investigators piece together the facts of a murder for hire and lead them to a killer? An elderly couple is found dead in their home. There is no sign of struggle. Police are unsure if the deaths are murder-suicide or a double homicide. The family of the victims is convinced it's murder. When the case goes cold psychic Noreen Renier is brought onto the case. Her readings point investigators in a surprising new direction. A doctor is found in a hotel parking lot. Recently divorced from her husband, she had been in the midst of an affair with another man. Could this be a crime of passion? After several months, investigators hit a dead end. Nine years later, in hopes of finding clues, the woman's family enlists the aid of psychic Noreen Renier. Can she provide the clues that will help break open this nearly decade-old case?